Here at CERN, Director General is as an important figure as the Pope for catholics or Papa Smurf for small forest creatures. He rules the greatest laboratory on Earth with an iron hand, while diplomatic immunity allows him to avoid parking tickets in Geneva. The current DG, Robert Aymar, is supposed to step down at the end of 2008. Last week, the CERN conclave rolled dice to decide who will take over the post for the following 5 years. 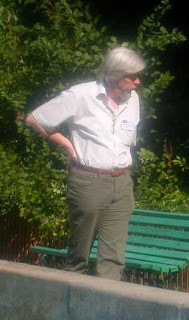 The lot fell on Rolf-Dieter Heuer, currently one of the DESY directors. By the end of this year, he should officialy become DG elect. Good news is that the nominee is a physicist, which might prove useful in the LHC days... It's also good news for ILC supporters, probaly less good for those who bet on CLIC. It's not a good news for me, as my April Fools prank will remain an April Fools prank :-( . By 7:10. I guess "DG" is not the right word? He had renamed himself as "CEO" to remind that he views CERN as a facility like a power plant. And indeed a factory deserves its physics research sector to be cut by 30%. We continue to thank Council for its wise choices. The new CEO is a safe way to have CLIC killed by default, hampering the future of CERN and thereby undermining the emerging European leadership in particle physics.